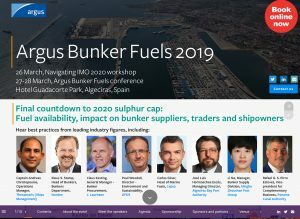 DHD have produced the digital event brochure for Argus Bunker Fuels 2019 which takes place from 26-28 March, at the Hotel Guadacorte Park, Algeciras, Spain. 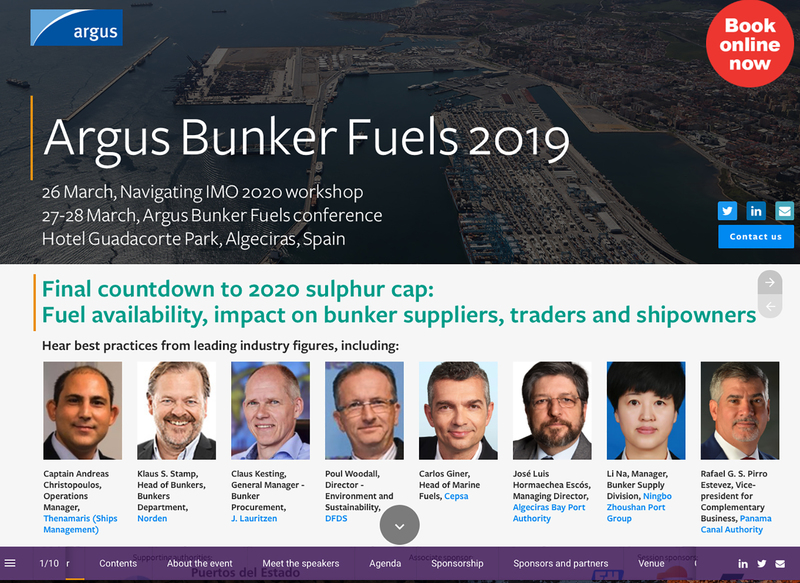 Join shipowners, operators, managers, and international peers at the essential Argus Bunker Fuels 2019 conference to track the latest market trends and shape your long term strategy. Why would you benefit from attending Argus Bunker Fuels 2019? Aimed at shipowners, operators and managers – Hear frank discussion, stimulating debate and live on-stage interviews given by representative from Norden, J Lauritzen, Thenamaris, DFDS, and other experts. Join high-level networking engagements with deal-makers and strategic experts, courtesy of the Algeciras port visit, champagne roundtables, networking lunches and evening cocktail receptions. Decision-makers are drawn from the entire bunker supply chain, including Peninsula Petroleum, Cepsa, Repsol, Vopak, Algeciras Bay Port Authority, Panama Canal Authority, Ningbo Zhoushan Port Group, Gibraltar Port Authority, Europea Group, Endress+Hauser, Norden, DFDS. Join distinguished peers from the bunker fuels market. Join the only conference to bring together the ports in the Gibraltar strait and clients. They come to question assumptions, build new eco-systems and do deals. Connect with and influence decision-makers from your market segment at the only conference that brings together the ports in the Gibraltar strait and their regional and global clients. You won’t get a better chance to show them who you are, what you do and how you can help them. Tell us what you need, and we’ll craft a sponsorship opportunity to help you to achieve your goals. If your main objective is to increase the visibility of your brand, we offer several high-impact branding opportunities at the conference. From lanyard or gift sponsorship, to pre-event and onsite advertising opportunities – on stage or via the conference networking app – we can design a package to suit your specific needs. Sponsor a number of the networking activities, or join an exclusive showcase of the newest technologies, innovative products and services in the popular exhibition area at Argus Bunker Fuels 2019. Make personal business connections with handpicked senior decision-makers during an executive briefing, or host a themed table during the extended networking lunch breaks. Reach an even wider audience of bunker fuel market participants through a presence on our conference websites, social media channels and marketing campaigns.